This hurts my brain like a cold ice cream cone on a hot day. Regan’s photos of Jamie Emery’s Speedvagen CX bike are frosty and the bike’s not that bad either. 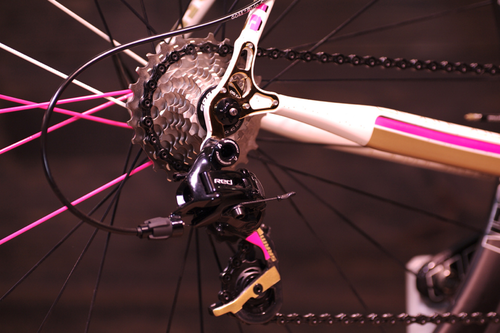 Sparkle paint job, custom painted SRAM Red, white and pink spokes? On any other frame, this would be a recipe for disaster but the chaos liquifies into a delicious treat on this bike. Catch this beast in Victoria, BC during CX season. Check out more of Jaimie’s Speedvagen at Regan’s Flickr. Thanks for sharing Colin!